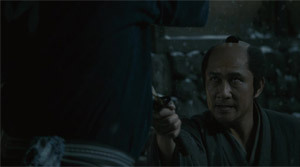 Story: Kingo Shimura (Kiichi Nakai) is a samurai who works under the leader of the shogun, Ii Naosuke. His future concerning his private life looks bright for Kingo as well since he marries devoted Setsu (Ryoko Hirosue). When Ii Naosuke becomes the victim of an assassination during one of his trips in the year 1960 Kingo loses his honor since he couldn't protect his master. He is still not allowed to commit seppuku and thus have an honorable death. Instead, he is tasked to find the rest of the assassins who haven't been captured yet. For thirteen years he is looking for them in order to present at least one head of the assassins in front of his master's grave. But without any success. 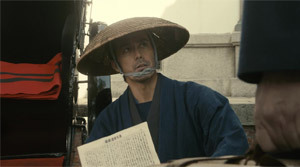 Instead, he finds himself confronted with the end of the Edo period and the dawning of the Meiji era. As his sword brothers wear Western clothes or exercise a simple profession he remains the only one who still wanders the streets as a samurai. Meanwhile, his wife Setsu has to put food on the table for two people all on her own. But suddenly, Kingo is informed of the whereabouts of the last remaining assassin: Jyubei Sahashi (Hiroshi Abe) who now works as a rickshaw puller. 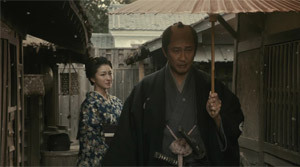 Review: The Meiji era has been the backdrop for countless adaptations which dealt with what a samurai needs to do in order to find his place in a world where there is actually no place reserved for them. "Snow on the Blades" takes the same line and has a revenge story in its center, yet deals with what it means to find peace and just live your eventually. Because that's what it's ultimately all about, no matter whether it's a police officer, a farmer, a fisher or just a samurai - you have to keep on living. However, this isn't really that simple when it comes to a samurai. Because their honor stands before their life or needs to be put on equal termns. So this story also revolves around a man entering a new era without losing sight of the essence of what it means to be a samurai. A thin red red line he needs to walk. 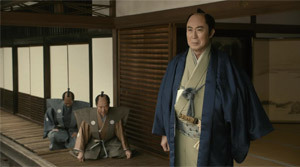 The film's story is based on a novel by Jiro Asada who has already delivered the original novel that "When the Last Sword is Drawn" is based on, in which Kiichi Nakai also played the lead character. Moreover, the fantastic Korean flick "Failan" is also based on one of his works. 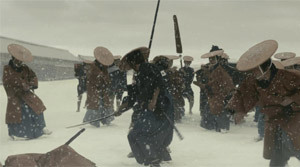 The complexity of the individuals and motives which are dealt with in "Snow on the Blades" are therefore safe from any criticism. However, soon one certain weakness becomes apparent which runs through the whole movie. In the end, this doesn't turn out to be a drama dealing with its theme very subtly and demanding of you to read between the lines. In fact, you really are spoon-fed everything, giving you no room for interpretation. This often proves to be annoying since you feel as if the director didn't have confidence in your mental processing. Furthermore, a result of this problem is that we get a few pretty hackneyed scenes. This also includes a bracelet and a flower which turn up just when we expect them the most because it serves the level of dramatic tension best. Creativity looks different. Joe Hisaishi's soundtrack may be nice, too, but it also pushes itself a bit too much into the foreground and makes some scenes even look a bit cheap. That's a shame since it's not necessary at all to give the relationships the appeal of a soap opera. The relationship between Kingo and his wife is multilayered enough despite only small hints given and Jyubei's possible love interest is worked into the movie subtly at all times. The actual drama revolves around the two samurais of course, which are completely lost in the new era and seemingly can only find their place in this world through an honorable death. 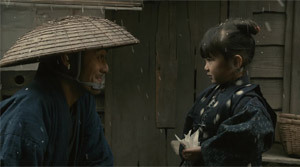 Particularly during one scene in which, out of the blue, former samurai come to the aid of one of their old comrades who is being harassed because of financial problems it becomes pretty obvious that the film deals with its subject in a rather heavy-handed fashion. 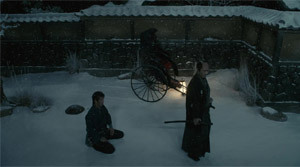 You surely could have laid out that the samurai are still present in the Meiji era, but aren't to be made out as such since they have been forced to exercise a simple profession in a more sensitive manner. Kingo thus seems to be something like a very stubborn relict of the past. But on the other hand, why should he deny being something that he is until he has found his master's killer? After that he is allowed to follow him into an honorable death anyway. Accordingly, Kingo doesn't really care about politics. Yet, he also has to realize how fast Japan is undergoing change. 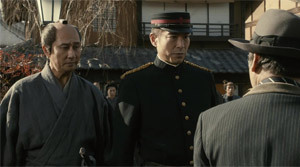 The audience is also presented with this fact through Jyubei, played by Hiroshi Abe ("After the Storm"), who contrary to Kingo tries to find his place in the Meiji era. Or at least it seems that way. "Snow on the Blades" clearly features some wonderful pictures, some of them are too obviously composed for the simple purpose of looking gorgeous, though. This particularly concerns the scenes in the snow. Yes, you can't help but regard some of them as a bit too forced. The several timelines we are jumping between aren't an inventive narrative approach either. Moreover, you shouldn't expect any outstanding swordfighting. There may be a showdown in the snow, but this one isn't that great because of its choreography. It's instead the two samurais' spirits which almost take on physical form and make the confrontation towards the end so thrilling. Despite a certain kitsch factor you still have to consider this drama well-achieved. The movie manages to convey what it aims for on an emotional level. It surely could have been done in a more subtle manner, but maybe you shouldn't be too strict.